Being somewhat of the “Bah, humbug” persuasion when it comes to the festive season, I do not enjoy much about Christmas – but one aspect I truly savour is the opportunity to gorge on Christmas pudding. The mere mention of this admittedly peculiar concoction of fruits, egg, suet and spice drenched in alcohol is, I realise, sufficient to make many people recoil. But if you've got this far, the chances are you're a fan, and it is with people such as you that I take pleasure in sharing the source of what just might be the best Christmas puddings on the planet. They come from a small Essex farm where confectioner extraordinaire Sandra McLaren (try her award-winning carrot cake) makes them in a former cowshed. She converted it into a state-of-the-art kitchen around 15 years ago, after discovering that the Christmas puddings she traditionally gave to friends were going down a treat. What makes a McLaren's pudding so special, I’m reliably informed, is the combination of absolutely premium-grade fruit, an extended soak in brandy and Guinness, and the use of the bare minimum of flour. The result is superbly moist, but also robust enough to stand proud on the plate once ignited in time-honoured fashion. Take my word for it: making a Christmas pudding at home takes hours – not to mention years of experience. Even so, it won’t be a patch on one of these – and the cost of the ingredients alone will probably match the £13.49 for an “entry-level”, 450g offering from McLaren’s. More committed pudding eaters, however, will probably want to go for the 800g option (£23.99) or, for real connoisseurs, the full Monty weighing a kilo (£26.99). The two smaller versions, incidentally, can be bought in fire-branded wooden boxes for an extra £2.50 and £1 respectively, and make great gourmet gifts. 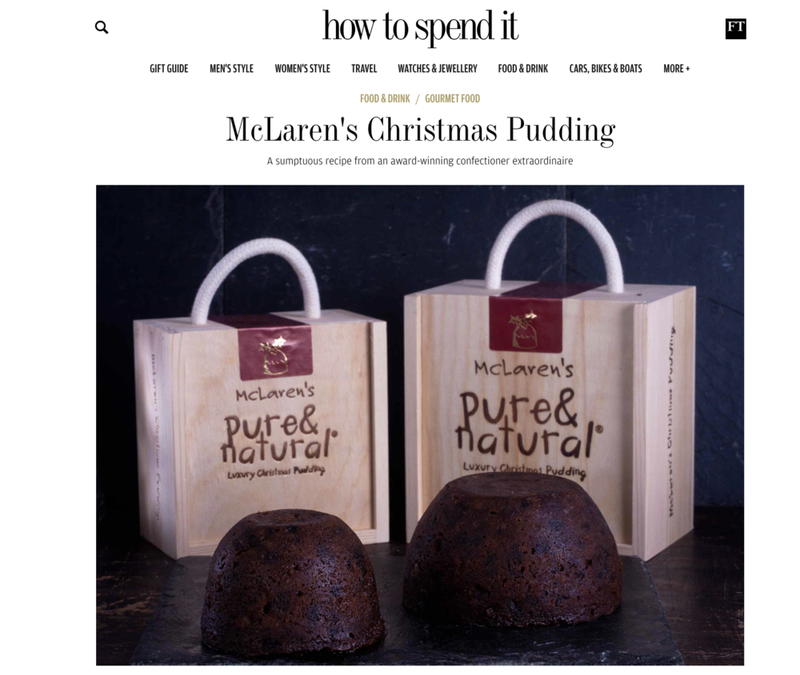 All can be purchased online – or, between now and December 24, you can try them and buy them from the McLaren’s stall in London's Borough Market. Optional extras include brandy butter and cream.